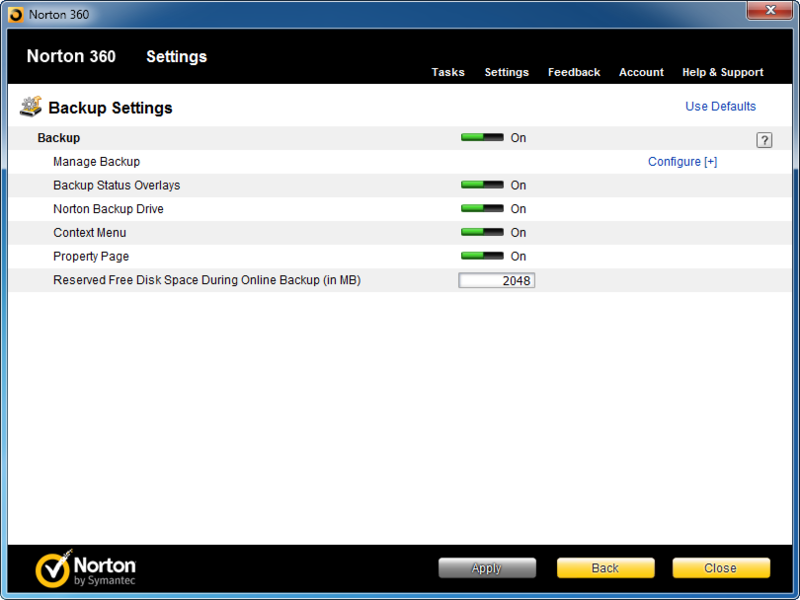 Norton 360 is a complete security and backup solution for home users. It protects your files against malware, secures the network communication and backups your files to local storages or to the internet. Which news comes with Norton 360 5.0? Norton 360 was released in version 5.0 a few days ago as a beta. The beta means that this build is not a final version of the product, but it has all the planned functionality and features. You can already try Norton 360 5.0 Beta by downloading it for free from Symantec’s website. Just go to the us.norton.com/beta. It seems like a tradition that Symantec will release newer version of Norton 360 each autumn. The fifth version of this security and backup software again respects the news in the Norton Antivirus and Norton Internet Security 2011. So, let’s take a look – what’s new in Norton 360 5.0? 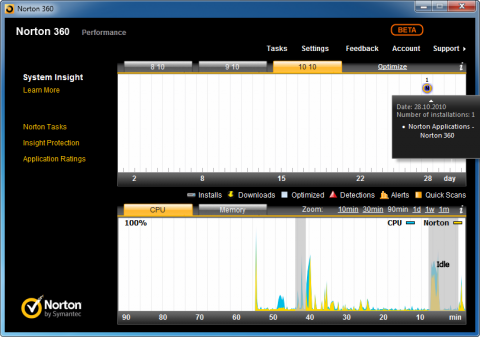 Norton 360 5.0 further improves the Norton Insight Technology. It is a set of tools which will protects your system together with classic malware detection and heuristic analysis. The Norton Download Insight works with file reputation and is able to tell you very fast if the file just downloaded is secure. The information is collected from all the users in the Norton Community. Norton Insight also protects your browser and instant messengers. But this tool isn’t only about the direct protection. It is also a powerful reporting utility. 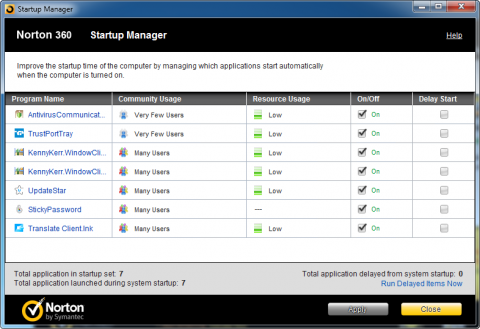 Norton Insight can give you a list of applications currently running, installed in your computer or starting together with Windows. 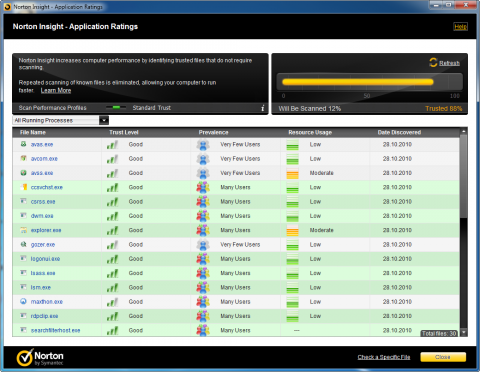 Each application/process has its Trust Level, Prevalence and information about resource usage. Norton 360 5.0 will also inform you via floating pane if any running process has a high resource usage. The Norton 360 5.0 comes also with a map showing current security threats on each continents. You can click them and see the details. It’s a similar functionality like in Norton Antivirus or Internet Security 2011. 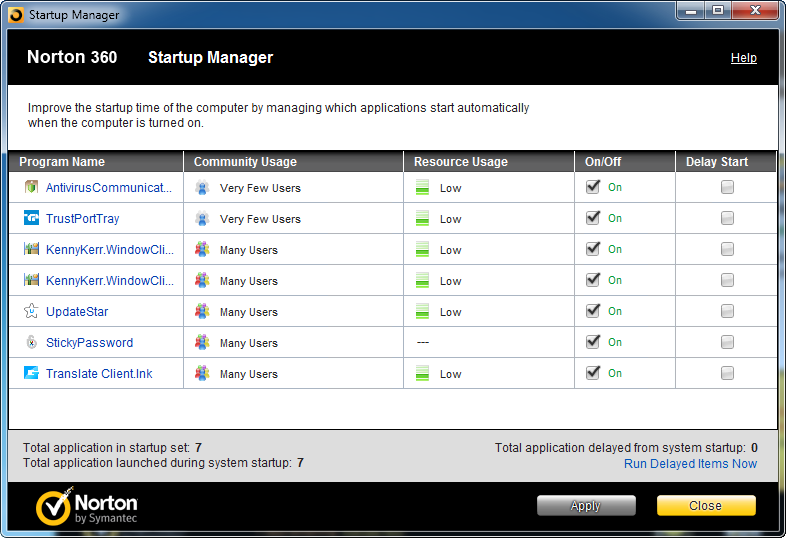 Another improvement in Norton 360’s user interface is a set of button at the bottom of the window. Using them you can swap the map to the Norton Online Family settings or to the Norton Safe Web tool, which can check provided URL. 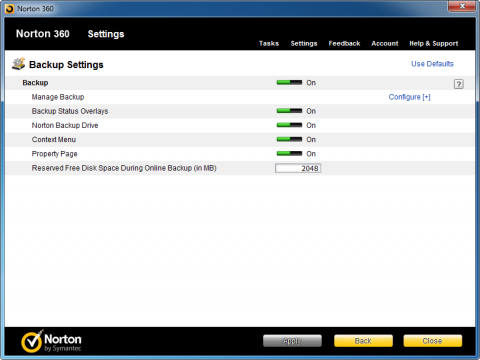 Norton 360 is a backup tool which works on file basis. So you can’t use it for a complete disk images backup. But it will help you with backing up your important documents and other files. The basic setting needs to define backup sets. I do not see any big differences against the previous version. You have to set the types of files you would like to backup, select the destination (local or external drive, Secure Online Storage) and set up the interval for automatic backup. If the default set of document types doesn’t meets your requirements, you can click the Add or exclude files and folders link and choose your own folders. You can also edit file types for each default presets. I don’t already remember if the next settings was available in the previous Norton 360 4.0, but I found it extremely useful now. 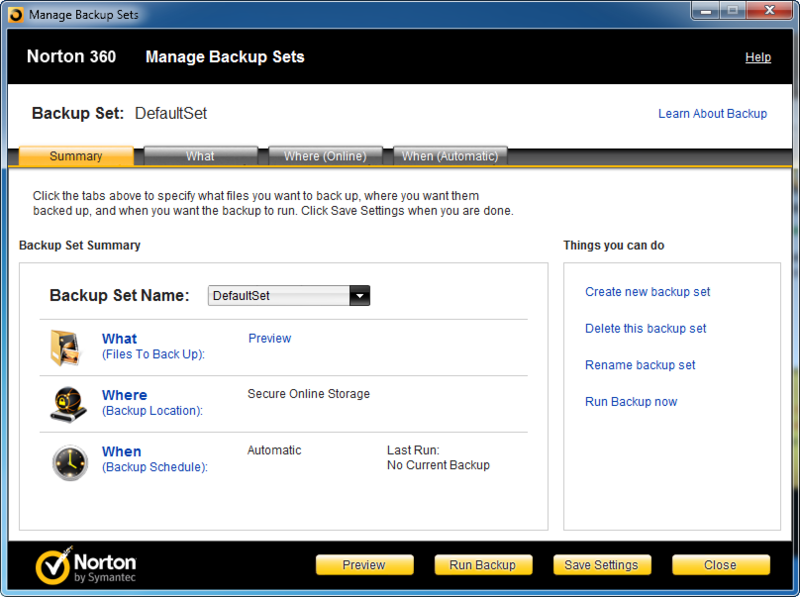 In the main window of Norton 360 5.0 click the Settings and continue with Backup settings link in the new window. Then you will see a couple of settings and at the end the settings for Reserved Free Disk Space During Online Backup (in MB). The default space is 2 GB (2048 MB). Why I found this setting useful? When I run online backup in Norton 360 4.0, I often go to run with low space on the disk. The reason is simply – online backup functionality packs all the backed up files to one large archive in your computer and then uploads it to the online storage. If you like your free space, you can reserve only a limited size for this large archive. So for my case, I’m happy that Norton 360 5.0 will not use 5 GBs or more of my disk. Another new backup functionality in Norton 360 5.0 is a link in Tasks pane. You can click it to simply Restore Online Backup via Browser and it will point you directly to the n360.backup.com website. Norton 360 5.0 is faster than its previous version – that is my personal feeling. The installation is done in a few minutes including download time. You don’t need to restart the computer; just right after the installation you are protected. The news in Norton 360 5.0 are not revolutionary; this version again brings some new protection introduced in NAV or NIS 2011.